Review Summary: A hard to watch film with great chemistry with some fine actors, 'Kadvi Hawa' shouldn't be missed. The movie ‘Kadvi Hawa’ has been designed in such a way to provoke contemplation and action and the movie has a mission that it achieves without any of the serious slips. It is requested to watch the movie because it is an important film that will offer an essential takeaway. The chemistry between Ranveer and Sanjay is darkly entertaining. You may even feel guilty while enjoying a moment of black humour in scenes between the two actors. With powerful dialogues by Nitin Dixit and achingly beautiful lyrics by Mukta Bhatt, the film is an engrossing watch. 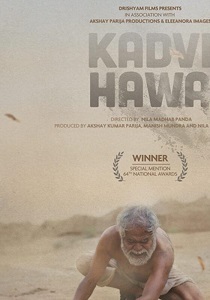 For a serious film on global warming, Kadvi Hawa is non-preachy and entirely watchable. It speaks about the state of the environment, the destruction of our civilization, the plight of the farmers and of the people living in coastal areas.